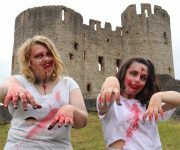 It’s just two weeks until Dudley Castle is transformed into an open air cinema showing the cult zombie movie Night of the Living Dead. The 11th century castle will become the dramatic backdrop as the horror film – celebrating its 50th anniversary this year – is shown on Friday, August 3. For the third year … Continue reading Zombie alert!